With the kickoff of the holiday season (and the weather!) underway, it’s almost time for the annual holiday organ concerts at the Fargo Theatre. The concerts, put on as a partnership between the Red River chapter of the American Theatre Organ Society (ATOS) and the Fargo Theatre, are a local holiday tradition spanning several decades. The concerts are held at noon — just right for anyone on their lunch break in need of a holiday serenade this December. Better yet, they’re free to attend! Just bring a non-perishable food item that will go to the emergency food pantry. “It’s a way for people to get out of the office and come and have a little Christmas cheer,” Beck stated. Whether you bring family, coworkers, or just yourself, you can spread Christmas cheer by listening to talented local organists play holiday tunes, donating food to those in need, and partaking in a local holiday tradition. “We definitely talk to a lot of people every year that say this is a family tradition for them, or just a tradition for their office. It’s really nice to be a part of people’s tradition,” Beck said. This year, the holiday organ concert dates are: December 10th-13th, 17th, 19th, 20th, and 21st. All of the shows start at noon and last around 35-45 minutes. For these lunchtime concerts, the Fargo Theatre even allows guests to bring in outside food, so there’s no reason not to spend some December lunches appreciating the sounds of the theatre organ. Lance Johnson, a member of the Red River chapter of the ATOS, is one of the organists who performs. Johnson has helped spread Christmas spirit to the local community through these concerts for many years. In a way, Christmas is what brought the organ to him. Another long-standing organ-based event at the theatre is Silent Movie Night, which began in 1974, where organists provide the movie score to classic silent films. 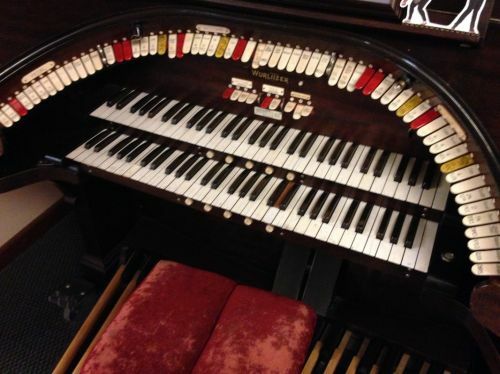 They play different sound effects and music on the Wurlitzer organ, which creates many sounds with its extensive range of instruments and percussion. While there are many events held by the Fargo Theatre, some of the most popular being live shows and movie showings, the organ-based events hold a special place in the theatre’s history. Johnson, the house organist of the theatre since 1973, walked me through the mysteries of the theatre organ and the Fargo Theatre’s past. That’s right. Without the involvement of the Red River chapter of the ATOS and local organists like Johnson, the historic, beautifully restored theatre that plays such an important role in the Fargo community might just be… a parking lot. Thankfully the theatre, restored to its original glory, seems like it’s here to stay, as does the Wurlitzer organ it houses. In addition to his role as the house organist, Johnson has been in business building pipe organs for 64 years, and helped build the Fargo Theatre’s organ. The organ, owned by the ATOS but housed at the theatre, is one of only 48 Wurlitzer organs in the country that still remain in their original location. However, it’s not the first organ to be played at the theatre. “The original organ in the theatre was very small. It had two keyboards, and seven sets of pipes,” Johnson explained. The organ now in use is four and a half times larger than the original, with four keyboards and 32 sets of pipes. Theatre organs are a type of pipe organ, and they were originally developed to accompany silent films in the early 20th century. Unique in their sound, capability, and size, theatre organs are like an entire symphony packed into one instrument. Think of an electric keyboard, but acoustic. The theatre organ creates music with large pipes and real instruments, stored in chambers, instead of electronically through speakers. The Fargo Theatre’s organ has four chambers, which are stacked in the upper portion of the walls on each side of the stage. The chamber shutters can be opened, allowing the music from the organ’s pipes and percussion instruments to sound throughout the theatre. The console, where the organist accesses the keyboards and controls, sits on a platform in front of the stage that can be lowered into the ground, or raised up, depending on the type of event. The theatre organ is a fascinating musical instrument that hugely impacted the early film industry. It remains a crucial part of the Fargo Theatre’s history, and events like the holiday organ concerts are a fantastic celebration and reminder of the theatre organ’s importance. “We’re proud to continue the tradition and give back in our own little way,” Beck said. Don’t miss the noon organ concerts at the Fargo this December. Bring your friends, family, or just your lunch, and go listen to talented local organists playing your favorite Christmas carols. Again, admission is free — just be sure to bring a non-perishable food donation for the emergency food pantry.